The bright and big time numbers on the display are easy to read from a far distance and it has 2 brightness levels: bright, dim or just turn it off. The adjustable dimmer enables you to set the display to a brighter setting in daytime and softer one at night. It ships with a micro USB cable as well as an AC adaptor so you can choose how to power it. Long press the button "FM" to scan radio frequencies automatically and save up the channels. if you see a small ""Bell"" on the top of the display area, that means you turned the alarm on, otherwise, you turned the alarm off. 1) Do not press two or more keys at the same time. 2) If there is any malfunction, please unplug the unit for 3 seconds. 3) The warm white light can be set with 10 adjustable brightness, but other light colors are not adjustable. 4) THIS LIGHT FEATURE ONLY WORKS WHEN IT IS PLUGGED IN. Sunrise Simulation. 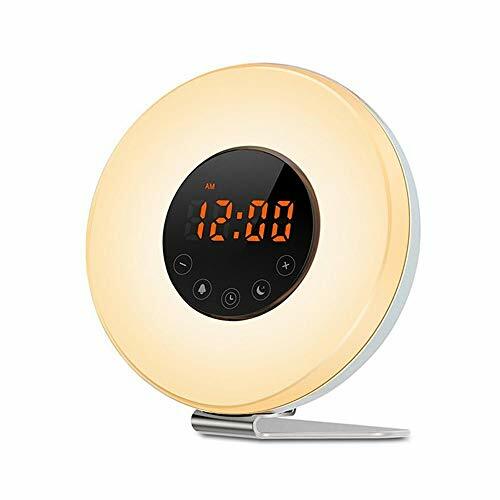 Sunrise alarm clock provides warm white light begins 30 minutes before your wake-up alarm time and gradually brighten from 0% to 100%, it will gently pulls you out of a deep sleep by increasing light levels, wakes you up slowly with simulated sunlight, just like the rising sun. 7 Vibrant Colors & 10 Brightness Levels. It can be used as atmosphere lamp by selecting 6 colors (Green, Red, Blue, Purple, Orange, indigo) for your preferences. Or work as a bedside lamp with 10 brightness settings in warm light, choosing a suitable brightness to make your eyes more comfortable. Snooze Function. SNOOZE" enter the snooze mode if you don't want to get up when alarming. The wake up sound will play again after 5 minutes and last 2 minutes. 6 different natural sounds including forest, birds, waves and so on. 7 is FM radio. Touch control. Sensitive touch control and different buttons deliver easy setting and mode switching. More convenient and effective to operate, beautiful life starts from one touch. Perfect Design. Sunrise alarm clock adapt a more considerate and concise design for both children and the old. Touch Control and large LED display make it easier for us to set up. Wake up light is functional and decorative, definitely your best choice! If you have any questions about this product by Nigecue, contact us by completing and submitting the form below. If you are looking for a specif part number, please include it with your message.